Rumors began last week that retired star Marshawn Lynch is pondering a comeback. Pete Carroll has been making it clear the high-maintenance Lynch won’t be back in Seattle. Since he retired at 29, rumors about a potential return by RB Marshawn Lynch will be around the Seahawks in the manner that facts swirl around Donald Trump: Annoyances to be brushed aside. The specter of Lynch surfaced the past week when a story on Bleacher Report claimed he told two unidentified ex-teammates he’s thinking about a return. So at a media chat after Thursday’s organized team activity at team headquarters, I asked the question of coach Pete Carroll that the Seahawks don’t want to hear: Has Lynch been in touch? No elaboration. No fawning appreciation. No well-wishing for Lynch’s retirement. Then Carroll grinned, mostly at himself for dispatching quickly an unwanted interruption. Even though his teammates respect and like him to the point of veneration, the coaches are so done with Lynch. They will never say so publicly, for all the obvious reasons. But to use a term from workplace management, Lynch was high-maintenance, and they are delighted to be free from it. Not that he wasn’t worth it. The coaches saw what everyone else saw: A relentless warrior who found yards where no one else could. He exceeded what anyone could have imagined at the time of his 2010 acquisition from Buffalo. But as with most high-maintenance employees, they tend to wear some people down. Lynch was as anti-authority as an NFL player can get without being fired. Whether it was holding out despite a valid contract, or offering the finger on national TV to the sideline playcallers, or using little passive-aggressive things like rehabbing away from the team, or wearing a “31” jersey at practice in support of holdout Kam Chancellor, Lynch was as independent toward the bosses as he was close to his teammates. Which made his anti-hero persona, including his disdain for media scrums, as compelling to fans as it was to teammates. But two things happened last year that made the coaches more eager to see the end of the Lynch era. The obvious one was the emergence of rookie Thomas Rawls. No one is ever likely to be Beast Mode, but the unlikely rookie was a bruising producer of tough yards who emulated, to a surprising degree, Lynch in his most vital virtue. The other was the episode before the first playoff game at Minnesota when he was recovering sufficiently from abdomen surgery Nov. 25 that Carroll said publicly Lynch was ready to return to action. “He feels good now; that’s why he’s back,’’ Carroll said at the beginning of week. “He wouldn’t be here if he didn’t feel like he could go. He’s ready to rock. During the week of practice, assistant coaches Tom Cable and Darrell Bevell, along with some players, said they thought Lynch was playing Sunday. Carroll said so on a weekly radio show Friday morning. 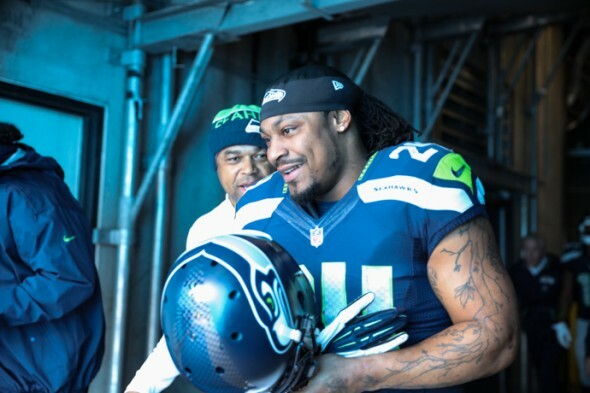 But Lynch surprised everyone later Friday by saying he wasn’t ready to play. No physical setbacks were reported, but he didn’t get on the bus to the airport. As supportive and enlightened as Carroll is when it comes to managing people, no boss likes to be publicly embarrassed. It also meant that tactically, in the injury absence of Rawls, the Seahawks were going into the subzero Midwest with a third-string running back in Christine Michael. The coaches privately had to be pissed. That they survived — a 10-9 victory, the fewest points by a winning team in the playoffs since 1997 — was one of the epic feats in franchise history. Yes, it took a missed chip-shot field goal by the Vikings’ Blair Walsh, but it was also only the third road win in Seahawks postseason history. Considering the conditions, and how they humiliated the Vikings in the regular season, the game may have been the most demanding of the Carroll era. Lynch was back for the next playoff game in Carolina, but the game was out of hand so quickly that running the ball was largely irrelevant. When Lynch announced he was done during the Super Bowl, the Seahawks coaches were already deep in the mindset that they were moving on because, feelings aside, the offense performed so capably in Lynch’s injury absence behind QB Russell Wilson and a re-jiggered offense. In the games without Lynch, the Seahawks averaged 148.1 yards a game, 12 more than they did with him. And in the final six regular season games, Wilson had 1,646 passing yards, 21 touchdowns, one interception, 69.1 completion percentage and a QB rating of 131.2. For the fall, in the unlikely event that Rawls hasn’t healed from his ankle broken in the Dec. 14 Baltimore game, the Seahawks loaded up in the draft with three young running backs. This does not look and sound like a team pinin’ for the Beast. Should Lynch truly want to return — his agent, Doug Hendrickson, said it wasn’t happening — the Seahawks hold his rights, and would deal him for a draft choice, unlikely to be better than a sixth- or seventh-rounder. I’ve been asked several times whether I think Lynch will come back. I say it’s easier to predict the date and time when the sun goes supernova than to forecast what Lynch will do. But I’m quite sure whatever he does, it won’t be with the Seahawks. Life in the NFL moves on quickly, especially when a team considers 11-7 a poor season and has a top-five quarterback at 27 entering his physical and psychological prime. But feel free to ask Pete Carroll. He won’t waste a lot of time answering. Those were my exact thoughts when this occurred. After that latest “Lynch” act, I bet Carroll called John and told him “no f’ing way Lynch comes back”. Pete resurrected Lynchs’ career, saving him from Buffalo and giving him a career in Seattle. I am frankly pleased they have closed this chapter, which gives the coaches players who will be team players who are coachable and want to learn, without the unknowns cropping up throughout the season. Frankly I believe the best thing Lynch could have done is agreed to be a slot receiver, as his career would have been extended another 3-4 years. He has great hands and can you imagine Lynch over the middle at the second level? Full speed into the secondary? OMG – It would be a first down + every single reception. Plus it would be fun to watch the DB’s play “matador” ball. Good point! Marshawn had a great ability to get open and was sure handed as a receiver. Great ballplayer. Tremendous will. But yeah, his uber ego self-branding was a little too emblematic of the times. The Super Bowl retirement stunt was unfortunate. The Minnesota meltdown was deplorable. The “pining” is for the team player who ceaselessly labors for the benefit of the team without the desperate need for attention or self aggrandizement. Lynch has exploited his brand well, but I think he resents all aspects of authority. He doesn’t trust any person/institution until they prove to him they’re worth it. Right, a trust issue with authority. I’ve always liked Lao Tsu’s idea of good governance. It should look like the governor isn’t around (until he or she is needed). The people can say “we’re doing all of this ourselves!”. Of course, it’s never true. Authority and leadership must be present at all times and should be given the benefit of the doubt (trust?) until proven unprovident. True. It’s not that Lynch didn’t work it out, but he was always pushing and testing, which subtlely created the space from management h craved. Not a bad idea in the slot, except Lynch wouldn’t like only five or six touches a game, even if it extended his career. When he gets amped for a game, he wants it all the time. Regarding high-maintenance players, Griffey was the local king of that dogpile. More recently, Marcus Peters was same for UW’s Chris Petersen. At the top level, a coach has to figure out how much to indulge genius talent. Maybe the toughest management topic in sports. Gary Payton comes to mind as well, with Dennis Johnson getting an honorable mention. Don’t forget Lou Piniella. Ask Howard Lincoln. Interesting – I didn’t know that about Griffey. His personality didn’t seem to be the type. As you were there, how did it manifest itself? Despite the bravado, Griffey was often moody and insecure. Lincoln found him too demanding, and was more than willing to trade him. That may be a perfect insight to why Lincoln’s term as M’s pres was so deplorable: If he cannot figure out how to KEEP the BEST player of the past few generations (I consider Griffey to be a larger “version” of Mays, who until Griffey I considered the best 5 tool player ever) then it shows he was not a baseball guy. I doubt Lynch would have lasted as long on any other team besides the Seahawks. Only Carrol would put up with his nonsense. It was mutually beneficial while it lasted. Lynch has to know he landed in the right place. Perhaps gratitude will emerge after retirement is permanent. So there’s hope for the “vertical” ? As I said, no forecasts regarding Lynch should be offered, or believed. I’ve been a bit disappointed that Lynch rarely if ever acknowledges how the Hawks organization in essence saved his career. He was part of a platoon at RB in Buffalo his last year and had a couple run ins with the law. He could have easily been waived and never played a down again. Sure, that’s how some professional athletes are but it’s still disappointing. Be even more disappointing if the stable of RB’s the Hawks have can’t come near Beastmode’s usual production. I’m not confident about Rawls returning at the beginning of the season but I don’t want him coming back too early like P-Rich did either. You’re right that Lynch’s compliments were always horizontal, never vertical. The RB situation is unknowable until Rawls performs in game conditions. The Seahawks know that, and it’s why they cast a wide net in the draft. “compliments … always horizontal, never vertical” – newest addition to the Art Thiel Classics.